Subscriptions in EasyCart are only available if you choose the ‘Stripe’ payment method or ‘PayPal’ payment method. Stripe has a much deeper integration offering more order management and customer updatability than PayPal, so for that reason, we always recommend you utilize ‘Stripe’ as your live payment processor in order to capitalize all the features that EasyCart offers. Other payment providers often do not have the necessary programming connections to utilize subscription services. 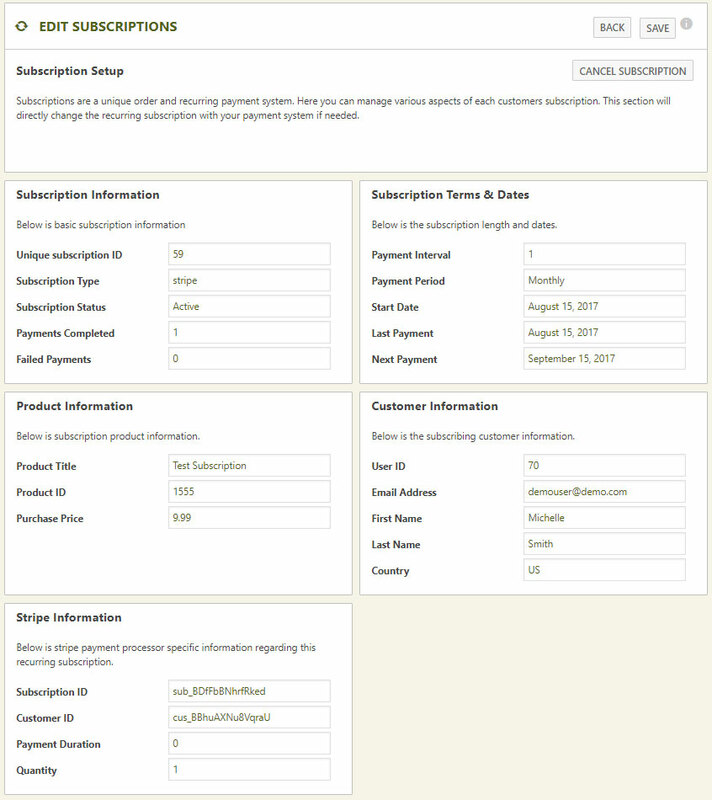 For the most part, the subscription manager only allows you to view the details of a particular subscription. With stripe, all of the subscription data is kept on their server, along with customer payment information, insuring your website is safe and secure by not storing this critical information. You Are able to see the subscription terms, payment periods, and payment dates on this screen. You can also choose to cancel a stripe subscription here and it will communicate back to stripe and cancel further payments. IF you choose to cancel the subscription at stripe instead of through this interface, it will also communicate to your EasyCart and show as cancelled. Customers can also manage their subscription by logging into their frontend account. Customers can cancel a membership, or even update their credit card information with stripe right through their own account, making EasyCart subscriptions fairly hassle free. Note: Subscriptions are not very editable because you are not allowed to change pricing, options, or data to them once created as this creates a different product and customers may not have agreed to upon purchase. Therefore, to adjust a subscription, usually the customer needs to cancel an existing subscription, and sign up for the new one with the changes made.